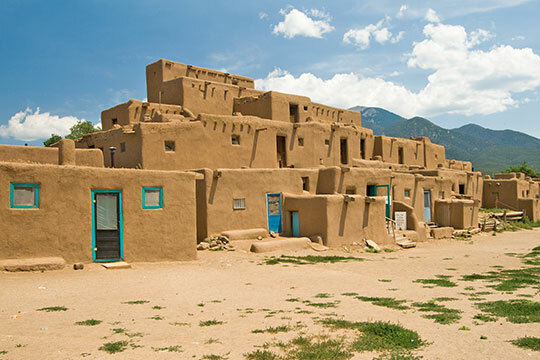 Photo: Taos Pueblo multi-storied residential complex of reddish-brown adobe. It was probably built between 1000 and 1450 A.D. Located about 1 mile north of the modern city of Taos, New Mexico. Listed on the National Register of Historic Places in 1966. Photographer: Luca Galuzzi, 2007, [cc-by-2.5 (http://creativecommons.org/licenses/by/2.5/deed.en)], via Wikimedia Commons, accessed December, 2014. In no part of the United States has there ever been such a protracted struggle for self-government as in New Mexico. In no other case has statehood been too long withheld. Perhaps nowhere in history is there such a series of failures, in what at the time seemed almost certainty, through unlooked for and often insignificant causes. Statehood was almost attained in 1850; it was lost by a handshake in 1875, by a sudden impetuous word in 1889, by a shiver of malaria and a miscalculation of time in 1894. During a 60 year period (1851-1912) the New Mexico territory was under the administration of a series of successive governors. When the 618th Congress met, in December, 1909, Mr. Andrews again represented New Mexico, having been re-elected mainly on the statehood issue. He pursued the course of wisdom by co-operating with the House committee on territories, with the result that on January 17, 1910, the so-called Hamilton Bill was passed by the house of representatives without opposition. It was received in the senate the next day and referred to the committee on territories. It was well known that Senator Beveridge had in mind a number of provisions varying from those in the Hamilton bill, but thanks to strong influences outside of Congress, preeminent among which was that of President Taft, there was now little outspoken opposition to statehood for either New Mexico or Arizona. The only division was as to preference for the senate or the house bill. The vote on this question was by strict party lines, the republicans voting for the senate bill and the democrats for the House bill, the result being 42 to 19 in favor of the former. On the final vote on the passage of the bill, the vote was unanimous! Shortly after two o'clock on the afternoon of Saturday, June 18, Speaker Cannon laid the bill as amended in the senate before the House. There was a moment of suppressed excitement, and then Mr. Lloyd, of Missouri, the senior democratic member of the committee, rose and said that while he was not entirely satisfied with the senate bill, yet in order to insure immediate statehood for the territories he would not oppose it. Instantly Mr. Hamilton, the committee chairman, moved to concur in the senate amendments. The question was put, viva voce, there being no demand for a roll call, and the House concurred by unanimous vote! The deed was done! The long conflict of sixty years was over! The President had signified his desire to affix the signature which would give legal vitality to the bill and transform it into a law before leaving Washington on Monday, so all the preceding formalities were hastened. On Monday morning, notwithstanding its length, the statehood bill was properly enrolled and ready for the official signatures. From the capitol it was quickly conveyed to the White House, where the President was ready to act. Here were assembled several of those who had been most active in achieving its success, with such representatives of the two territories as were in the national capital. The President said a few words of congratulation, and then proposed to affix his official signature. The postmaster general presented a gold pen with the request that it should be used, and Delegate Andrews produced the unique gold-banded quill taken from the great American eagle captured in Taos, and furnished for the occasion, in its beautiful case, as a patriotic service by George B. Paston, when he had no thought that Death would forbid his presence at the ceremony. The President wrote half of the signature with the former and the remainder with the latter, returning the pens to the donors as mementos of this great historic occasion. The White House clock stood at 1:40 p.m.
That signature ended the drama of the "Struggle for Statehood." There had been more than fifty statehood bills in the sixty years of effort. Those few pen strokes transformed a Statehood Bill into a Statehood Law. L. Bradford Prince, LL.D., A Concise History of New Mexico, The Torch Press, Cedar Rapids, IA, 1912.